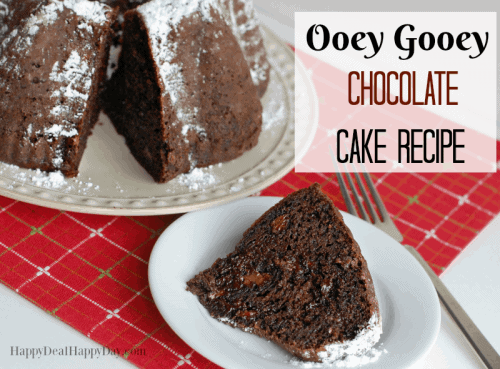 ooey gooey cake recipe Archives | Happy Deal - Happy Day! 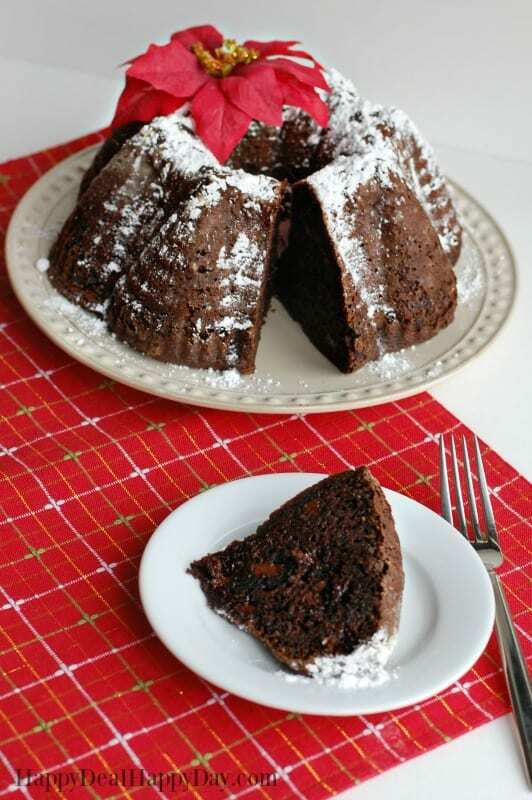 This Homemade Moist Chocolate Cake Recipe with Pudding is one that my mother used to make each year for our family around Christmas time. I want to point out though that it is not just a cake for Christmas – it’s yummy all year long. But it looks very seasonal this time of year with a dusting of confectionery sugar “snow” and a faux poinsettia. 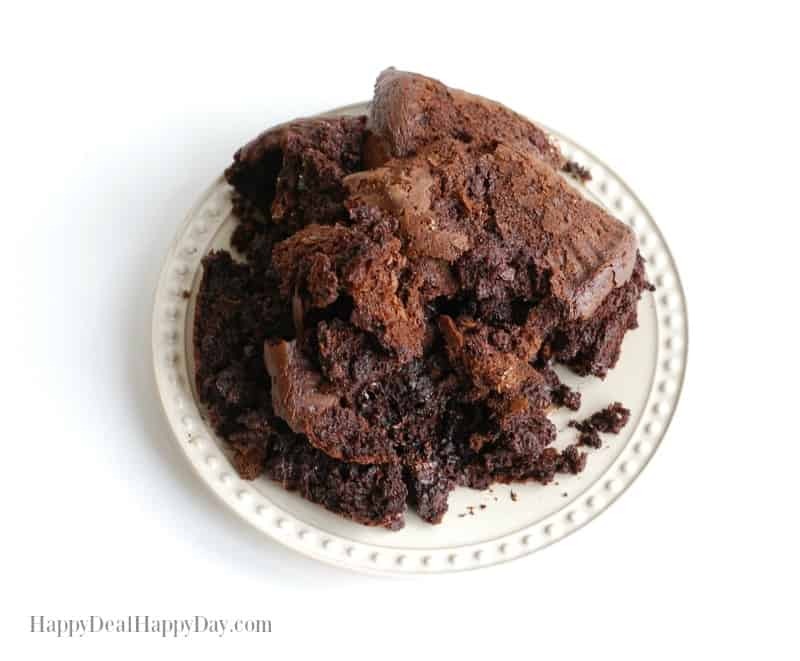 This Homemade Moist Chocolate Cake Recipe will sure be a big hit at any holiday party you have this season! Pre-heat the oven to 350°. 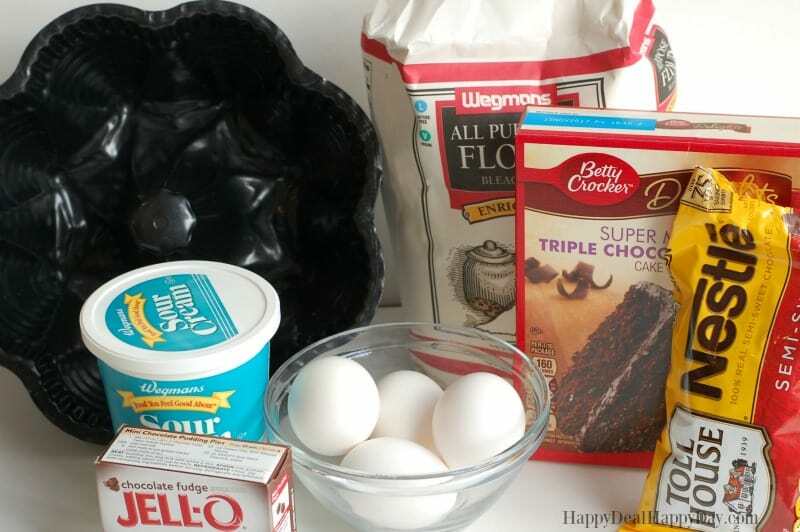 Get a large mixing bowl and add the cake mix, pudding mix, sour cream, 4 eggs, water and oil all at once. Mix well and beat by hand for 4 minutes. You will then fold in a full bag (12 oz) of chocolate chips. There is a trick to keeping the chocolate chips from all sinking down to the bottom of the batter – and that is to dust the chocolate chips with flour before you fold them in. 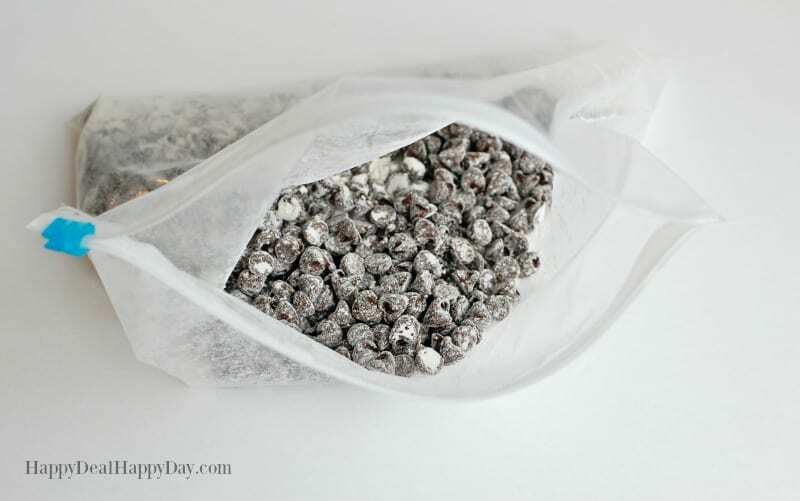 Take a gallon size plastic bag and add a teaspoon of flour in with the 12 oz bag of chocolate chips. Shake the bag until the chips are fully covered. Then stir them into the cake batter. Pour the batter into the bundt pan and bake at 350° for 50 minutes. After you pull the cake out of the oven, let it sit for 5 minutes and wait for the cake to deflate a bit. Then place a plate over the bundt pan, and flip the cake over onto the pan. I wouldn’t wait longer than 5 minutes for it to cool, as it will adhere to the pan. This cake is SO rich, moist and delicious that it does not need frosting! Just sprinkle on some confectionery sugar. This looks like a dusting of snow on a beautiful Christmas cake! Add a poinsettia as well for a festive Christmas party! 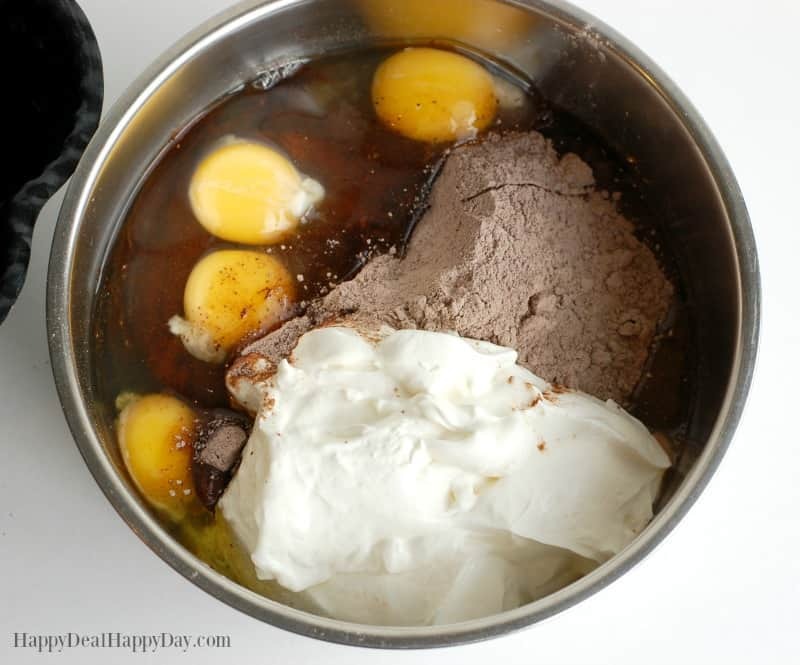 Get a large mixing bowl and add the cake mix, pudding mix, sour cream, 4 eggs, water and oil all at once. Mix well and beat by hand for 4 minutes. You will then fold in a full bag (12 oz) of chocolate chips. 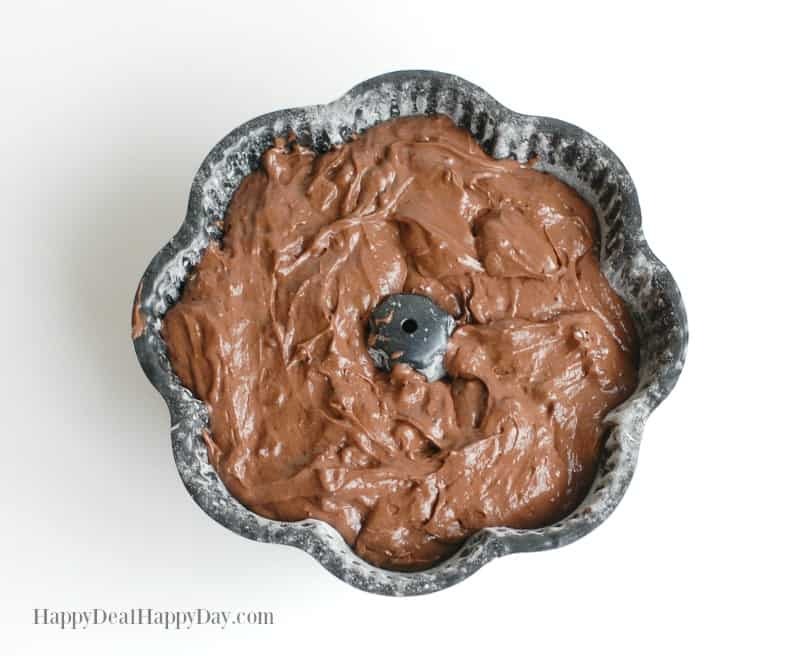 There is a trick to keeping the chocolate chips from all sinking down to the bottom of the batter - and that is to dust the chocolate chips with flour before you fold them in. Take a gallon size plastic bag and add a teaspoon of flour in with the 12 oz bag of chocolate chips. Shake the bag until the chips are fully covered. Then stir them into the cake batter. 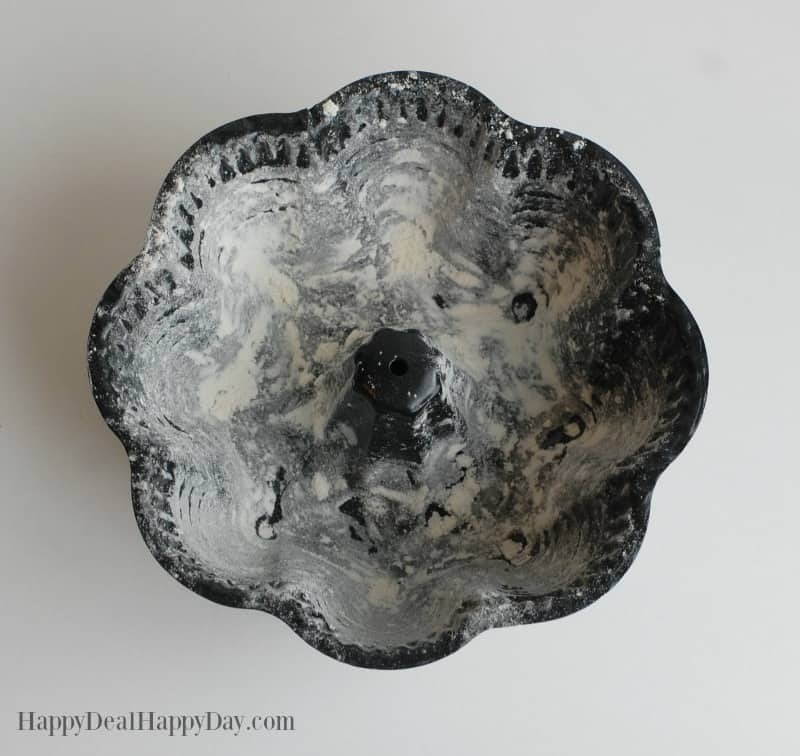 Grease your bundt pan with Crisco and dust it with flour. 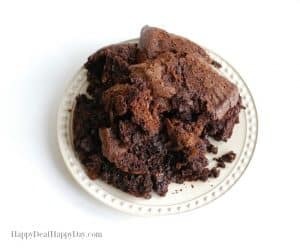 This chocolate cake recipe really likes to stick to the bundt pan, so be sure to do this step with a healthy layer of Crisco. After you pull the cake out of the oven, let it sit for 5 minutes and wait for the cake to deflate a bit. 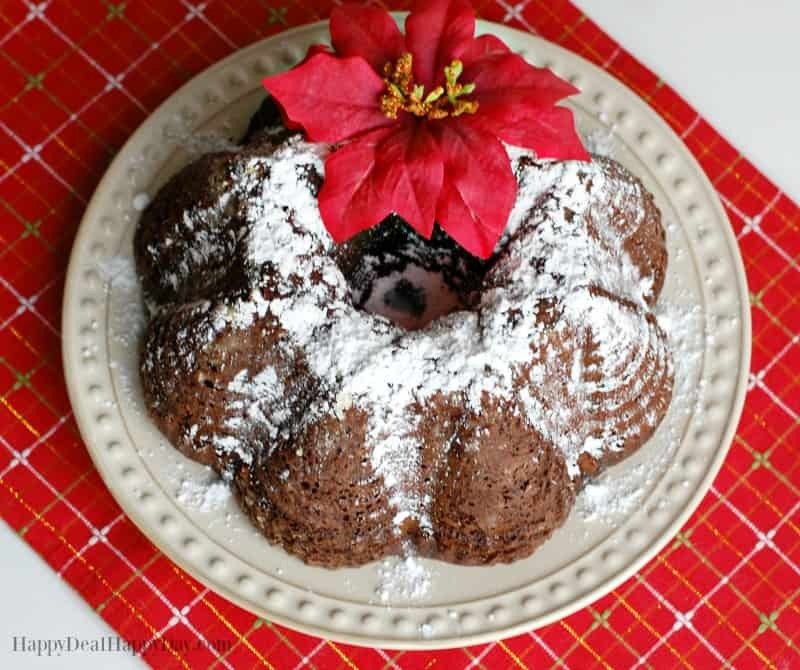 Then place a plate over the bundt pan, and flip the cake over onto the pan. I wouldn't wait longer than 5 minutes for it to cool, as it will adhere to the pan. Dust the top with confectionery sugar and enjoy! Chocolate Covered Oreos – Christmas Version! Chewy Chocolate Chip Cookies | Your New Favorite Chocolate Chip Cookie Recipe!